JPEGMAFIA delivered one of our favourite albums of 2018 so far with Veteran, and he's now announced plans to take the record on tour later this year. 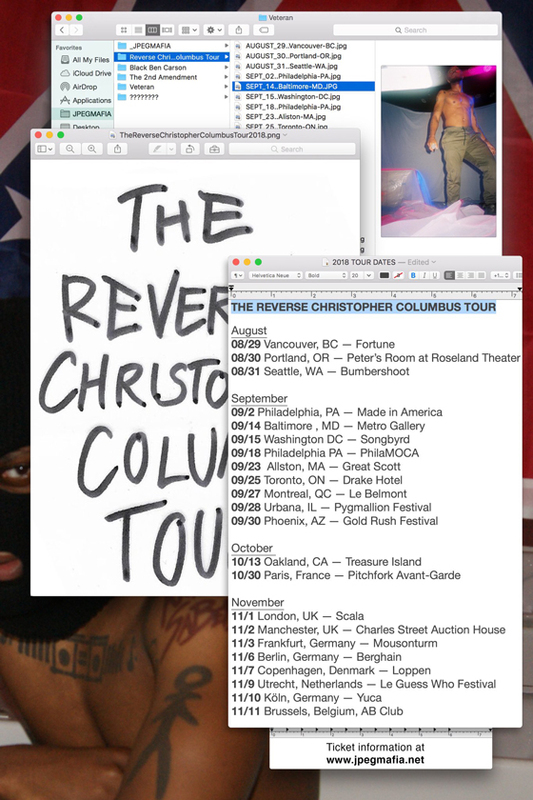 Today, the MC and producer born Barrington Hendricks has announced "The Reverse Christopher Columbus Tour," named after the Italian explorer/colonizer "cuz that n***a got lost." JPEGMAFIA will find his way to Vancouver to open the tour at Fortune Sound Club on August 29, touring eastward across the continent before making his way to Europe in October. Additional Canadian dates are set for Toronto and Montreal. He'll play the former's Drake Hotel on September 25, and the latter's Le Belmont on September 27. Alongside the announcement, JPEGMAFIA has also shared "Millennium Freestyle," a Backstreet Boys "cover" left over from the Veteran recording sessions. You can take in his twisted take on the boyband's material below. Tickets for all shows go on sale to the general public Friday (July 13) at 10 a.m. A pre-sale begins tomorrow, with further information available through JPEGMAFIA's website.